The winged primrose willow was identified in 2011 in several rice fields near Richvale in Butte County. Since then it has spread to several other fields, up to 3.5 miles south of Richvale. Winged primrose willow was recently given an “A” pest rating by CDFA. What this means is that this weed is now considered to be of economic importance and may trigger an enforcement action by the state. Currently, no actions are being considered, but its presence will disqualify a seed field. The rice industry is implementing an outreach, monitoring and control program for winged primrose willow to stop its spread and reduce infestations. 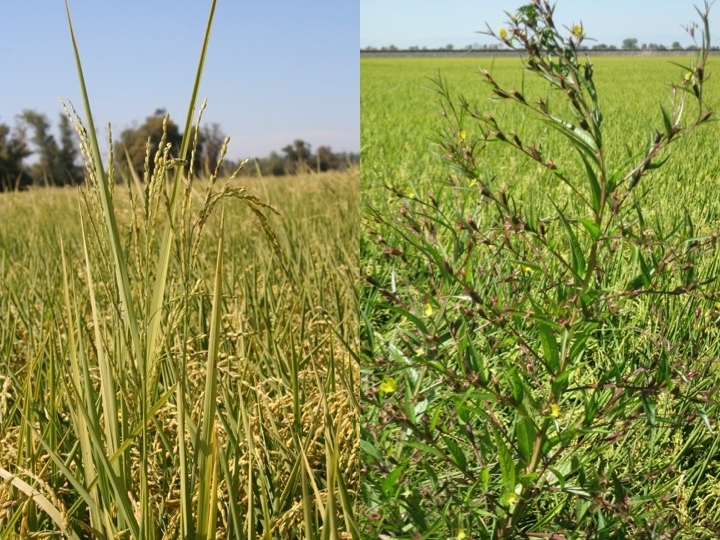 Red rice has been found in a few locations in California over the years. In 2003, its presence was confirmed in six fields. In some of these fields, growers were able to eradicate it. However, since then, red rice has been found in other locations. The exact number of locations currently affected is unknown, but estimates are around 15. At this moment, red rice does not represent a threat to the industry. But if this weed spreads, it can severely impact the rice industry, affecting yields, quality and production costs. To get an idea of its potential impact, just ask any southern rice grower about red rice and you'll get an earful. UCCE will be collaborating with other organizations and agencies to get information on identification and management of these weeds. We will be sending information out through our newsletters and websites, so make sure to be subscribed. In the meantime, here's a list of links with relevant information on these two weeds.